This California Veggie Bowl with Crispy Rice, Soft Boiled Egg + Shallot Lime Vinaigrette is the perfect light lunch that can be prepared in advance. Dice sweet potato into small squares and toss with coconut oil and 2 pinches of salt. Add mixed greens to a medium sized bowl and top with quinoa. 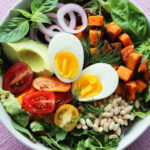 Arrange the sweet potato, red onion, avocado, tomatoes and puffed rice around the bowl and place the 7 minute egg in the middle. Serve with salad dressing on the side.